LEDGlow’s Advanced 3 Million Wireless USB Truck Underbody Light Kit features (6) multi-colored underbody tubes giving your truck's underbody customizable LED lighting with multiple patterns and tube expansion capabilities. 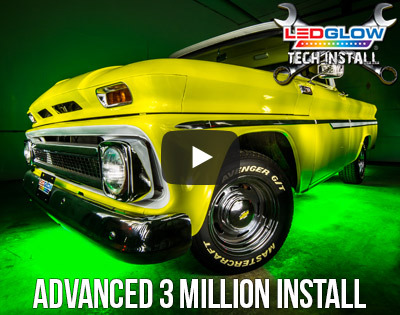 LEDGlow’s Advanced 3 Million Color SMD USB Truck Underbody Lighting Kit has been revamped to include ultra-bright surface mounted LEDs that allow for a much brighter and spotless glow than 5mm LEDs. Featuring a flat mount tube design with 15 degree angled mounting brackets that take up less space than the previous model, this underglow lighting kit allows for a brighter and stronger color spill that surrounds the bottom of the truck while keeping the tubes concealed. This Advanced 3 Million Color SMD USB Underbody Lighting Kit includes (2) 46”, (2) 36” and (2) additional 24” tubes that provide added underglow lighting for trucks or vehicles with a larger wheel base. 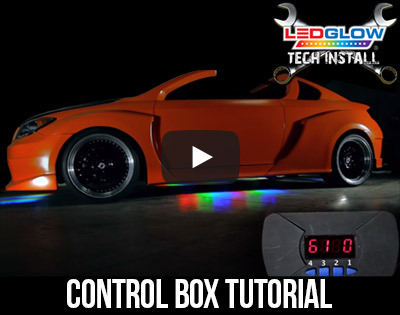 This underbody lighting kit is fully customizable allowing you to program solid colors, patterns and pattern speed using the included Advanced 3 Million Control Box. The included control box features 7 preset solid color modes with 18 different shades per color. This kit will also allow you to create any solid color you desire simply by pressing the pause button during the color fade mode, as well as allowing you to run two solid colors at the same time! Included are 9 preset lighting patterns that feature various color cycle, color fading, and color chase modes, and 18 preset multi-color lighting patterns are included and feature chasing, strobing, fading and flashing modes. All 27 preset lighting modes are completely customizable letting you select the speed of the pattern, which solid color is used as the base color, and which colors you want to flash or run through the pattern. The options on this kit are truly endless! The integrated lighting modes can be operated with the included 4 button wireless remote or by using the function buttons located directly on the control box. This control box has an easy to read, red digital numeric display that will show you what pattern, color, speed, and all other functions that are currently running. The included music sensor hardwires to any preamplifier source letting the underbody kit react to the beat of the music playing inside of your vehicle. The sound activation mode features 9 different sensitivity settings, and allows any lighting pattern be sound controlled, not limiting you to only certain sound activated patterns. The control box includes a mode recall feature that will remember the last setting the underbody kit was set to prior to your vehicle being powered off. 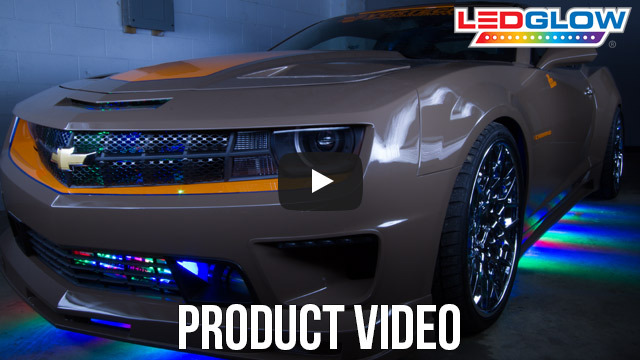 By utilizing USB connections, this kit is exponentially expandable using LEDGlow’s USB extender kits letting you easily add additional 46" and 36" underbody tubes, 24" grille tubes, 24" wheel well tubes, as well as 15" interior lights. Does not connectbtomandroid, like other devices and was a bit pricey.. Overall with all my complaints it is a really cool bright undergrowth, I do love it, I like the fact I bought wheel well lights and have a total of 12 light bars! I had enoug bars to put in my grill and there is light everywhere! Under my dash as well!! It took me 15 hours to install all 12 bars and wire up everything neat.. Most of my trouble was drilling holes through steal and just crawling under the truck with dust getting in my eyes, that held a lot of time back, but it went smooth and I had a lot of bars! I recommend getting wheel well lights it makes a difference and extra bars to light the sides and grill, go with 12 bars, I still had a left over bar so I put it underneath in the middle where light was low.. I like the fact I have a single cab so I hadn't need to put four inside, I love the light and flash patterns.. I have put leds on 4 of my vehicles. These are the best by far! I put this set on my 2010 suburban XLT, after the set of StreetGlow, gave me nothing but trouble ! ! My wife has these also on her horse trailer and her Silverado 3500 hd dually. No problems with this brand , I like the angle built into the tube mounting brackets also . GREAT PRODUCT. This a quality product. I put it on my 05 Dodge Ram 1500 and put the truck in a parade for my company. It's hardy and the lights are very bright. I'll be buying from LEDGlow in the future.